Non lasciare che il tempo limitato in Perù ti impedisca di visitare la magnifica Valle Sacra. Scopri di più sulla regione in meno tempo in un tour privato di un'intera giornata da Cusco, ideale per i viaggiatori di breve durata. 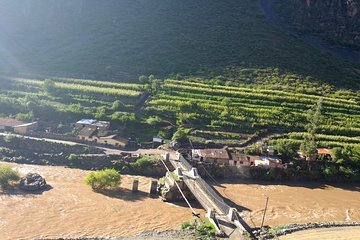 Con una guida privata, visiterai Pisac, sede del mercato indiano di Pisac e delle rovine Inca; ammirare i siti archeologici di Moray e la fortezza di Ollantaytambo; e conoscere i processi industriali pre-Inca alle Salineras di Maras. Pranzo e ritiro e riconsegna dell'hotel sono inclusi. We had Richard and Ronny as our driver and tour guide. They were very friendly and knowledgeable about everything we saw. I highly recommend them and the fact that we were able to speak English and Spanish made the trip that much better. We were so glad we did this tour so we could really see the countryside. Cusco and Machu Picchu are great but this made our trip! This tour was fantastic! We saw four wonderful archaeological sites that were really inspiring in addition to several local stops; one where we learned about alpaca products from animal to finished product. The day was literally packed with adventures. Richard, our tour guide, couldn't have been more knowledgeable, helpful or easy going. I'd highly recommend this tour and Richard as your guide! The local tour company contacted me the night before the planned tour and stated the tour guide would pick us up at our hotel at 8am. On the day of the tour, no one showed up, so I contacted the local number, and they stated they made a mistake and were finding a guide for us and would call us back. It was 9am and no one contacted me. I had our hotel concierge contact the company for me to verify if someone was still coming in Spanish. They hung up on her. Eventually a guide did arrive about almost 10am but spoke only Spanish. I had requested for an English speaking guide. Since much of the early morning was wasted, we decided to go with the tour, and the tour company promised us they would take us to all the places we had paid for. Luckily Edgar proved to be an excellent and safe driver. We saw all the scenic Ruins of the Sacred Valley and my daughter and I were impressed by the beautiful natural mountainous landscapes of the area. Luckily I had read about the sites prior to taking this tour, since we did not get a narration or history of each place we visited, because our guide spoke only Spanish. This was not his fault. I give 5 stars to Edgar for his driving ability in getting us to our destination safely. He knew the area in the back of his hand. The only place we did not go to was the restaurant mentioned on the tour for lunch. We were ok with that, because we would have rather seen all the sites vs wasting an hour eating. Luckily we brought our own snacks. It was a great tour. I enjoyed it. Richard had a good knowledge of local areas/history and spoke great English. He arranged the trip really well and showed us some local cuisine. We really enjoyed it. We really enjoyed this tour. Richard was wonderful! He was very knowledgeable and was able to bring the history of this area to life for us. He went out of his way to make sure we were comfortable and that we did not feel rushed on this very busy tour. We were so impressed by this tour that we requested Richard for our private tour of Cusco also. Truly an amazing day. Amazing tour! Patricia and Richard made this day so special and memorable!Best tour guides ever! Wonderful tour! A very long day but Richard the guide made it very enjoyable. He was very knowledgeable about each of the sites. This tour was definitely worth it especially when you only have one day to explore Sacred Valley. Had a great private tour with our very knowledgable tour guide Richard. We covered 4 very popular sights and visited them in the opposite order than all the tour busses did so it never was too crowded. He even stopped by a store in a village on the way when we said we needed to stock up on some supplies for our hike to the Rainbow Mountains the following day. This tour was definitely worth the money. Even though there might have been cheaper tours in the city, those are always large groups and not very personalized so we both agreed that having paid a bit more for a private tour was absolutely worth it. Definitely can recommend it! We had a really great day/time with our private guide/driver and most importantly he drove very safe in a country where traffic is known to maybe not be the best in the world. We did all in reverse order as all other group tours did it the other way around which was a smart move by our guide. He was extremely well informed and had answers to all our weird and usual questions. Got to see the major sites and spent enough time on each to get a good impression of each. Only thing is that most close their doors at 17:00 so some where maybe a tad rushed as there is a lot of driving going on during the day. This said, the SUV was very comfortable and again, which I cannot underline enough he was a very safe driver. Even the ultra touristic tourist trap of a lunch place was actually not half bad we usually hate these places but again nothing to complain about. We got there relatively late so maybe that's why it was OK. This was a very enjoyable day trip. Richard was absolutely lovely and very knowledgeable. Would definitely recommend this tour.